Communication with the ISEE-3 satellite was successfully re-established with the goal of commanding the satellite to change its trajectory with the goal of putting it into a libration point orbit that would allow it to resume its original mission goals of collecting data for solar physics research. The trajectory change goal unfortunately could not be completed due to the failure of the onboard thrusters. This failure was apparently the result of the loss of nitrogen pressurant in the Hydrazine fuel system. 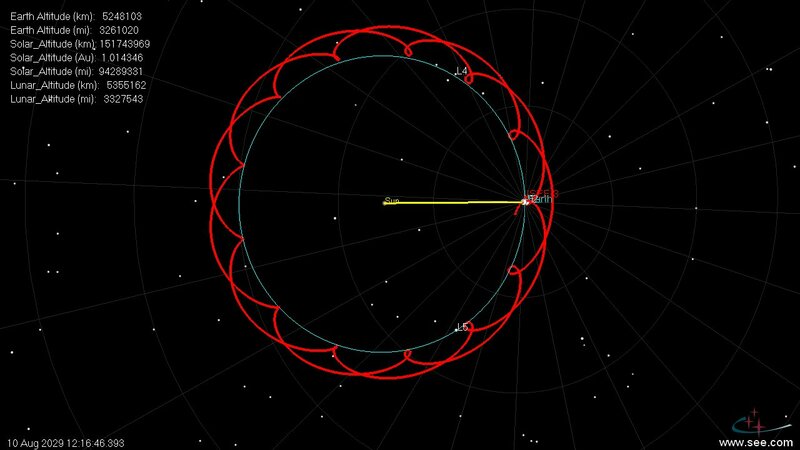 This inability to change the spacecraft’s orbit rules out the original reboot mission goals which would have provided long-term data collection from the satellite instrumentation package using modest antennas. After the orbit change attempt, the ISEE-3 Reboot Team powered on the instrumentation package and began data collection from the instruments to assess their current physical status and usefulness for any ongoing scientific mission. We are now redefining our mission goals to obtain the maximum scientific usefulness of ISEE-3 in its new interplanetary orbit. 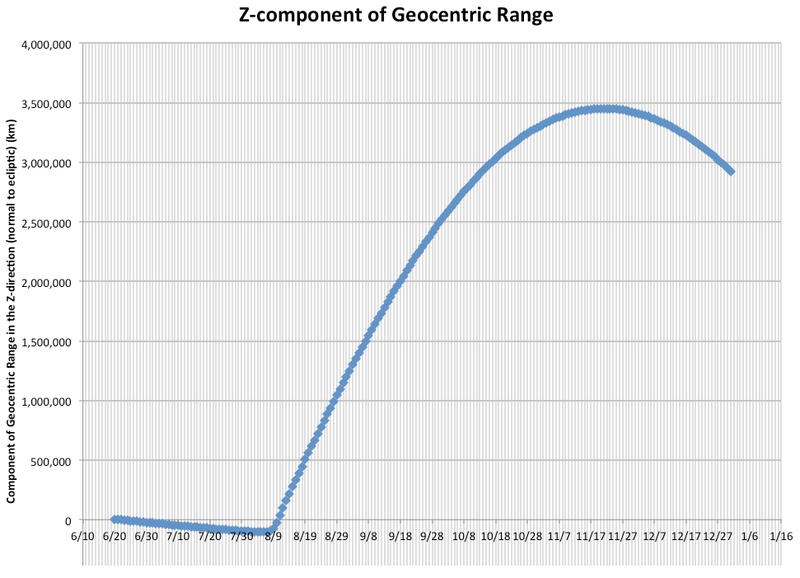 Figure 1 shows the flyby orbit and the long-term sun centered (heliocentric) orbit. This rendering shows the projected position of ISEE-3 through August of 2016. The flyby of the Moon increased the orbital energy of the spacecraft. 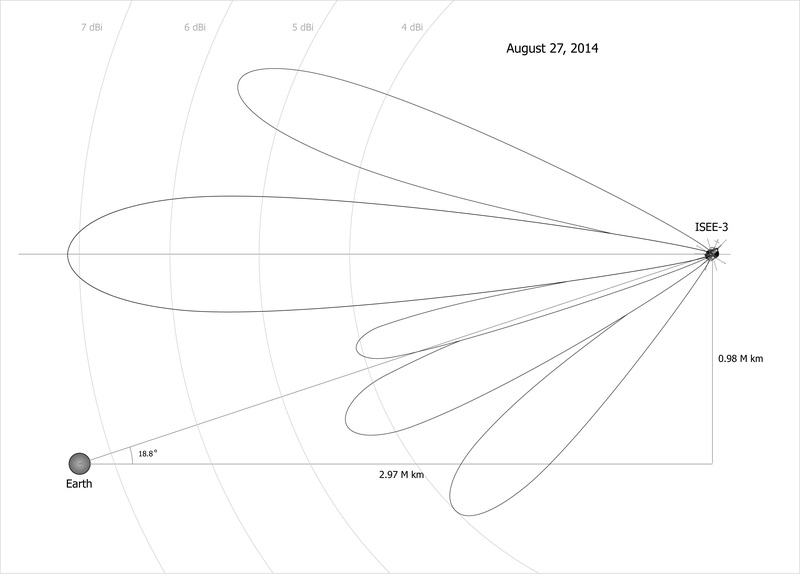 The original orbit, from 1983 through August 10th 2014 was interior to the Earth’s orbit around the sun. The orbit of the Earth is the light blue ellipse. The red line is the new orbit, but with respect to the Earth. This is why there is the small red ellipse in the first year near the Earth/Sun L5 location. That the large and small ellipse represents is the eccentricity of the orbit. The top of the large ellipse represents the maximum distance from the sun, which is about 1.2 astronomical units or about 180,000 kilometers. 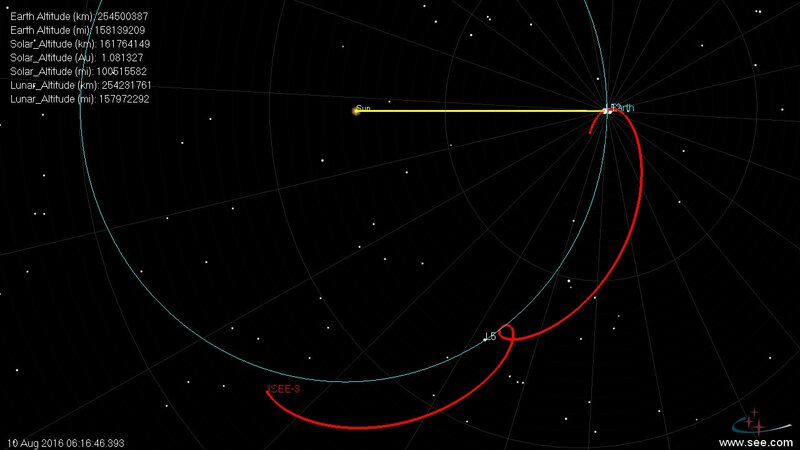 The ISEE-3 spacecraft is traveling slower than the Earth during this time. The top of the small ellipse is the closet point to the sun, which touches the orbit of the Earth, which is about 146 million kilometers from the sun. Figure 2 shows the orbit for the next 15 years, until the return of the spacecraft for another encounter in seven years at about 30 million km and then back to Earth orbit in 15 years in August of 2029. It is not that easy to tell from the graph in figure 6, but the distance from the Earth of ISEE-3 is increasing faster as it moves away from the Earth, than it did on the way in. This is because the spacecraft is farther from the Earth now in heliocentric distance, than on the way in, about twice as far. This is why that we will not be getting much data after early 2015 until it gets close to the Earth again in 2021. As the spacecraft moves farther away from the Earth, sunlight gets weaker and thus the amount of power generated by the solar arrays is less. We were astonished when we found out prior to the flyby that the solar arrays were putting out considerably more than current computer modeling of array degradation suggested. This is a major mission enabler now that the spacecraft is outside of the Earth’s orbit. Marco Collelouri (our controls and AOCS engineer) ran a calculation that indicates that our minimum power will still be about 86 watts at 1.2 astronomical units, the aphelion of the ISEE-3 orbit. This does mean that we will have to turn off one of the two transponders, but if we do that we can then power the most critical experiments, which begins to lead us to the science part of this status report. One last note about spacecraft health is that though we do see some degradation in the electronics on the spacecraft, including the communications system, we feel that there is every chance that in seven years, and even in fifteen years, ISEE-3 will still be a functional spacecraft, a remarkable testament to the people that built it! Though the planned mission goals cannot be met the reboot team feels ISEE-3 still has a useful scientific role to play. In its current orbital configuration the spacecraft will be able to provide data from a number of instruments as outlined in the previous section. Ground station tracking and data collection is the most critical of the factors. With increasing distance of the satellite from Earth we face the challenge of receiving a weakening signal. The ability to command the satellite to turn on/off or configure instruments must also be considered and the window for determining which experiments to turn on and support is very short if we are to realize the maximum scientific benefit. The ISEE-3 Reboot team feels that at this point time is of the essence in redefining mission goals and configuring the satellite and propose the following plan to be implemented immediately. Redefine the mission as a solar physics data acquisition of indefinite length. 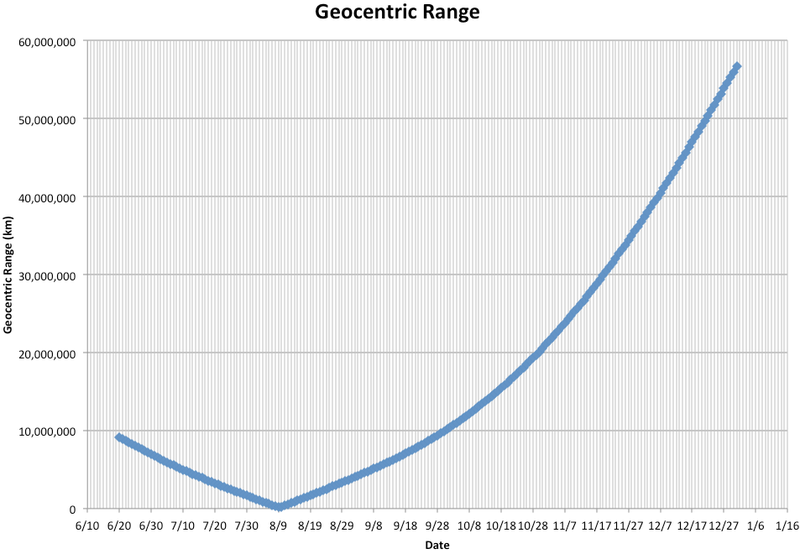 The new mission length will be measured in weeks and months and will be ultimately defined by loss of telemetry. The limited power budget of the satellite and the slower telemetry data rates will require us to select only a subset of the onboard instruments for the ongoing mission with more instruments being shut down as lower data rates render them less useful. An initial list of instruments and their proposed status is contained in Table 1. Initially, the cosmic ray instruments will be powered off and further instruments will be powered off as the data rate slows. We are soliciting the input of the ISEE-3 science community for their recommendations. 2) Solidify current tracking station commitments and solicit new resources (dishes) to extend data collection time. The amount of useful data will be determined by the signal strength which determines the data transfer rate we can use. The signal strength will be a function of the gain of the ground stations we use. Currently the ground stations we have do not provide 24 hour coverage and the satellite cannot buffer data so there will be data lost regardless of satellite distance. 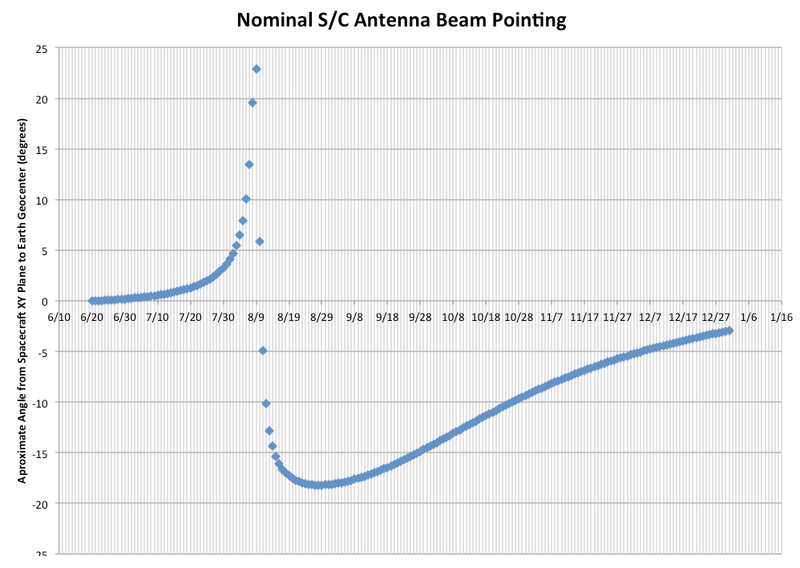 Since ISEE-3 has passed the closest point to earth and is now on an outward bound trajectory the soliciting of new ground station tracking with higher gain antennas and longer coverage is imperative to the success of the new mission goals. The spacecraftforall.com website was set up in collaboration with Google Creative Labs, a kind of think tank for the company. They have poured considerable resources into this, partially as a way to tout the graphics and capabilities of the Chrome browser, but they have been incredibly supportive of our science goals. This commitment continues. We are working toward getting the full real time data display system working within the next several weeks. The purpose of this is to promote STEM education and the dissemination of science data to the public as well. Not only is the real time data going to be available for use by citizen scientists, the data will also be archived and preserved. The data will also be provided to the science community for conversion to their preserved science data formats for their own purposes. It should be clear that one of the core ideas behind the ISEE-3 Reboot Project has been citizen science. What does that term mean? For us it is the ability for people to see our data, and for us to provide explanations and context for the data. You might ask, don’t scientists do this already? Well, yes but often it gets lost in translation. Solar physics and the study of it is exceptionally important to our modern civilization. In the recent solar cycle (cycle 24), the majority of the community was considerably mistaken in their predictions related to solar activity. It is of major importance to our civilization to understand why we don’t understand the sun and to build support for investments to increase our level of understanding. Recent articles have reached the public consciousness about how a solar flare could basically fry all of our technology and how one missed the Earth in 2012. It is a known fact that one such flare happened in 1859 and caused havoc on even our primitive telegraph system at the time. Anyone that says that we fully understand the Sun, does not fully understand the sun or the state of the science today. In an era of competing financial priorities in government, communicating this to the public is important for all of us as without modern electrical systems, we would all be in a very difficult position, extremely quickly.